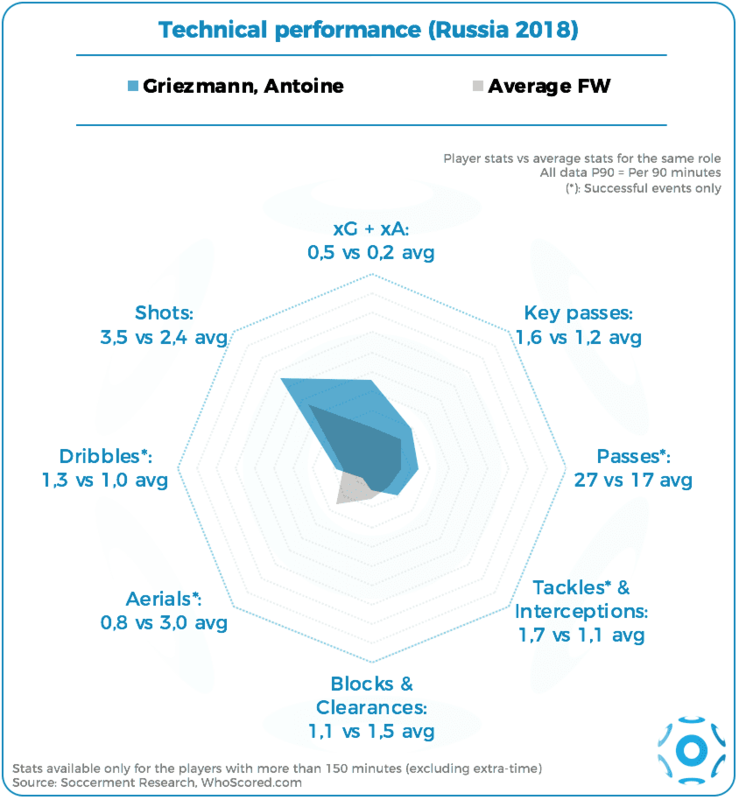 We introduce Soccerment Performance Ratings (‘SPR’), an algorithm-driven system aimed at offering a rigorous and unbiased view regarding the performance of football players. What better way to launch SPRs, than by assessing the World Cup performances? 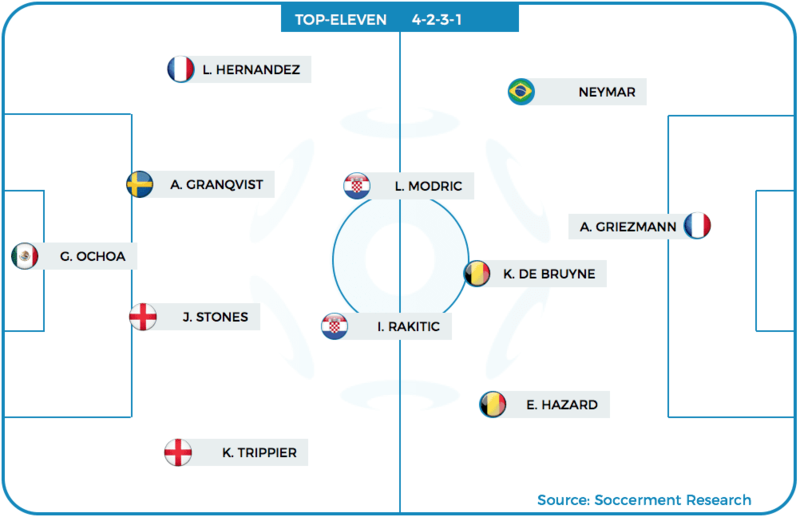 We use our brand-new algos to draft the World Cup’s Top-11 (plus subs). Who makes the cut? 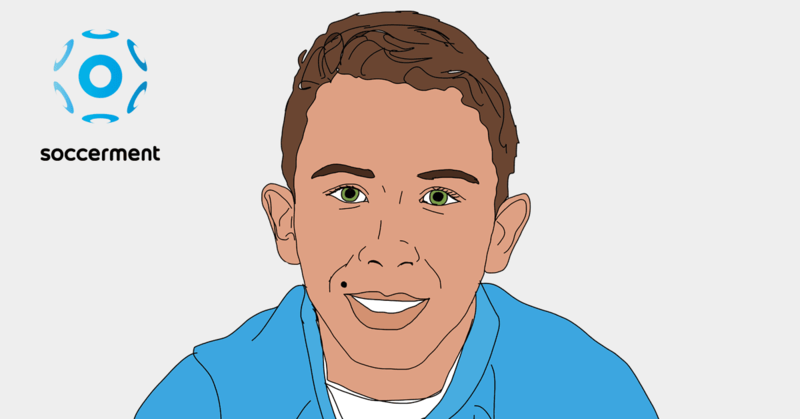 Soccerment’s vision is to enhance meritocracy in football, through data analytics and technology innovation. 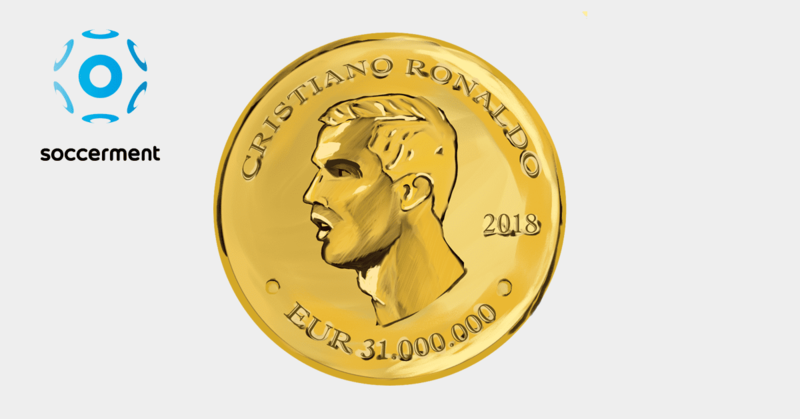 Our core mission is the production of unbiased and rigorous tools to analyse the performances of football players, to facilitate the discovery of talents and foster their improvement. You will hear more about this from us in the next few months, as we finalise the development of our software and hardware tools. 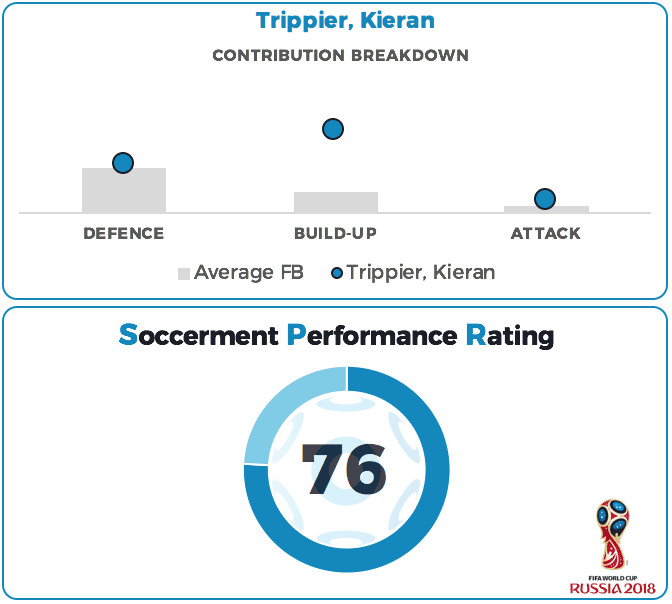 With the World Cup of 2018, we start unveiling one of the software tools we have been working on for months: Soccerment Performance Rating (‘SPR‘). SPR is a series of algorithms, which take into account all the events that happen during the course of a football match (we feed our algorithms with the data as recorded by Opta). The high complexity of analysing every single event is distilled into one single number, the rating, which reflects how a player performed, relatively to those in the same role. We split the players into the following categories/roles: goalkeepers (GK), centre-backs (CB), full-backs, right or left (FB), central midfielders (CM), central attacking midfielders (CAM), wide attacking midfielders, right or left (WAM) and forwards (FW). 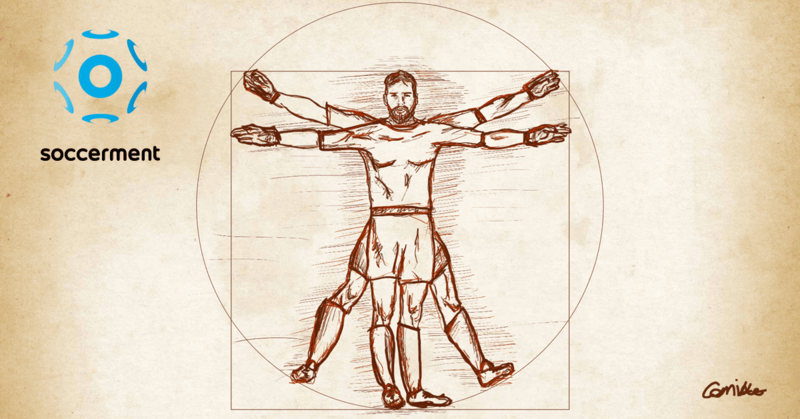 SPRs assess a player’s performance by breaking it down into three parts: the player’s contribution to the defensive actions, to the buildups and to the attacks. The players’ positive or negative deviations from the role averages determine their rating: SPR is a relative rating, not an absolute one. In football, a tournament develops very differently as compared to a league. More so than in most of other sports. 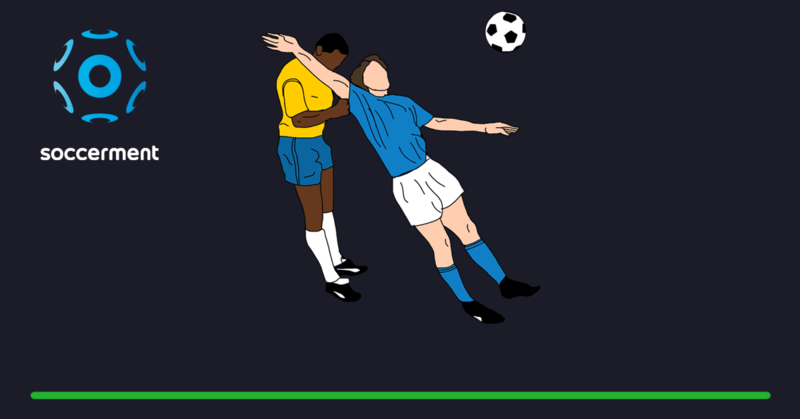 This is due to the randomness that makes football so special, which is amplified during a tournament: fewer matches (hence fewer scoring opportunities) means that chance has a higher impact on the final results. Further, with most of the matches being knock-out rounds, a high psychological pressure facilitates mistakes. At ‘Russia 2018’, for instance, we saw a lot of own-goals, defensive mistakes and so many matches were decided by set-pieces. What normally works during a league competition, for example ball possession (see our correlations), is often less effective in a tournament, where capitalising from single situations is of utmost importance: France won the World Cup with a mere 49.6% ball possession. In the Final against Croatia, after the first half, Le Blues were winning 2-1, despite a 33% ball possession and zero (ZERO) non-penalty shots on goal. 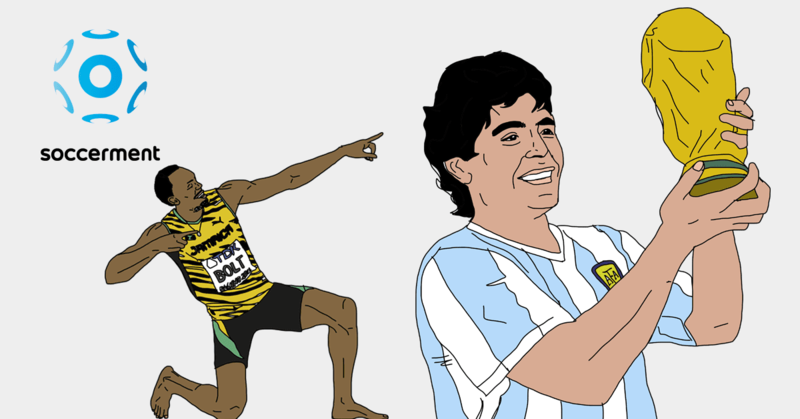 The history of the World Cup is full of special situations also when it comes to single player performances. Some of the readers won’t be so young to not remember the exploit of Salvatore Schillaci at ‘Italia 1990‘. 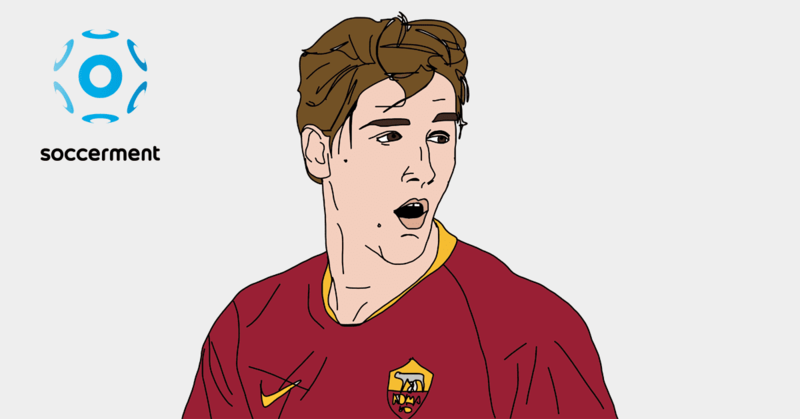 During those four weeks (9th June – 7th July), the Italian forward was simply unstoppable, scoring with ease, like he had never done before and like he never did since. We mention this to introduce some adjustments we are making to our SPR, for this occasion. In order to avoid getting carried away or being misled by the stats recorded by a player in one or two very good matches (maybe against Tier 2 or Tier 3 teams), we try to find a way to reward consistency. To do this, we adjust our ratings, re-calibrating the P90 stats (P90 = per 90 minutes) according to the total playing time. While it might be unfair to those players who were eliminated soon in the competition, we believe it provides an overall better picture of the performances. For this same reason, for our Top-11 list (plus subs) we select only those who played at least 225 minutes (2.5 matches). Alright, done with the introductions and ready to display our Top Eleven list, here below pictured in the form of a 4-2-3-1 formation. We use this formation because it was the most common at ‘Russia 2018‘: we calculate that it was used in 38% of the occasions (42% in the group stages). Standard Liège’s Guillermo Ochoa became famous to the wide public during ‘Brazil 2014‘, especially thanks to the match that Mexico played against Brazil, a goalless draw in which Ochoa had to make 6 important saves, a couple of them being really miraculous. A World Cup expert, he confirmed his good relationship with the tournament at ‘Russia 2018‘. In Russia, Ochoa made 25 saves, as many as Tibhaut Courtois did, but in almost half of the playing time (360 minutes Ochoa vs 630 Courtois). We calculate that he saved 81% of the shots on target against, 83% excluding the penalty scored by Granqvist (Mexico – Sweden 0-3). 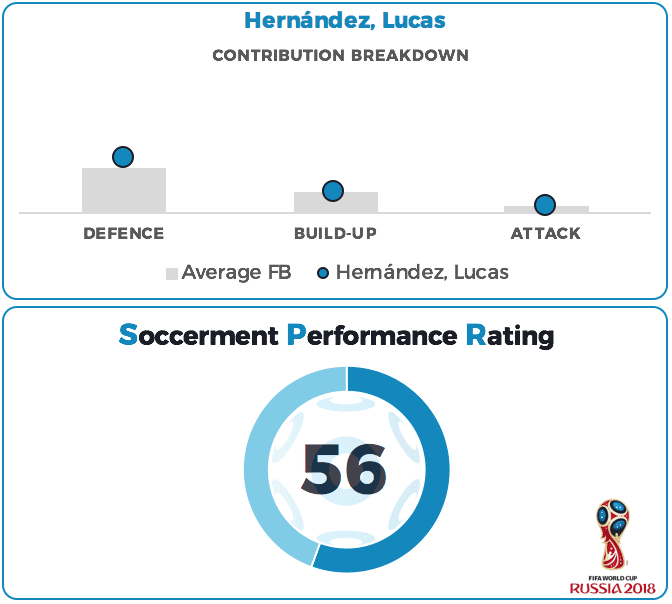 He receives a Soccerment Performance Rating (‘SPR’) of 62. 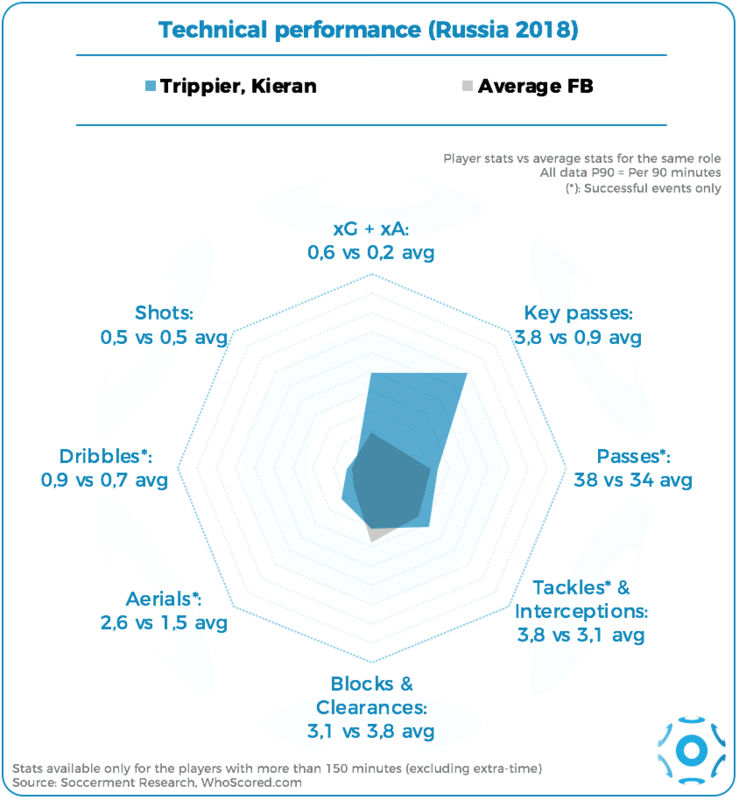 Tottenham Hotspurs’ Kieran Trippier was certainly a key player for England at ‘Russia 2018’. He played 576 minutes in total, scoring once (a superb direct free-kick in the semi-final against Croatia) and completing one assist. Trippier played as a right wing-back in Southgate’s 3-1-4-2, which partly explains why he was more involved in the build-up phase, as compared to the standard full-backs. Among other stats, our Soccerment Performance Rating rewards his high Expected Assist per 90 minutes metric (xA P90), of 0.5 vs the average of the role being at 0.1. This helps at explaining his high SPR of 76, the highest in our system. Real Madrid’s Marcelo recorded, according to our model, the top performance among left-backs. However, the time-adjustment we are making has a meaningful impact on his overall valuation (he only played 280 minutes). Thus, he does not enter our Top-11 selection. Instead, we field Atletico Madrid’s Lucas Hernández. Notably, Hernández completed 2 assists during the tournament. Hernández receives a SPR of 56. 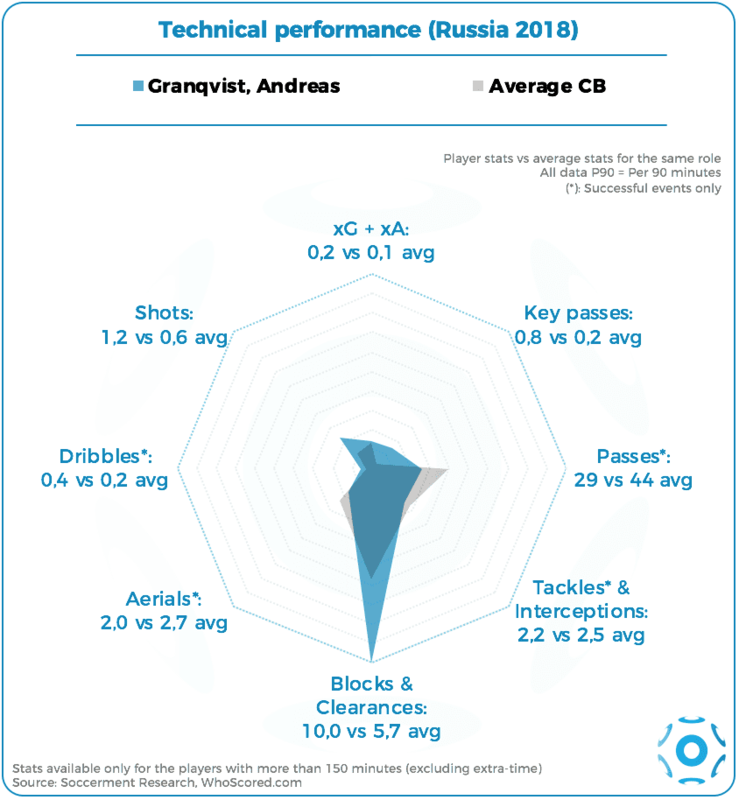 The captain of his National team, Andreas Granqvist, who recently joined Helsingborgs IF, was really instrumental for Sweden’s advancement towards the quarter-finals. He played 5 full matches and scored two penalties: against South Korea and Mexico. What was really outstanding, however, was his defensive contribution. He ranks first for the number of shots he blocked (13) and ranks 12th for the number of clearances per 90 minutes (7.4). Quite an old-style way of defending, but effective enough to make Sweden unexpectedly progress to the later stages of the competition. Granqvist’s performances grant him a SPR of 65. Manchester City’s John Stones played in between Kyle Walker and Harry Maguire in a line of three defenders, quite atypical for the English football, but that proved to be effective. Along with his teammate Walker, Stones was deputed to start the build-up from the back. Something that the duo have no problem at doing, after training under Guardiola. However, what really differentiated Stones from the other central-backs of the competition was the danger he was able to create in the opposition box, on corners and other set-pieces. He scored twice in the 646 minutes (in 7 apps) he played at ‘Russia 2018’. John Stones receives a SPR of 63. He played for almost 700 minutes in the competition, running for a total of 72.3 km, scoring twice (1 penalty) and providing 1 assist. 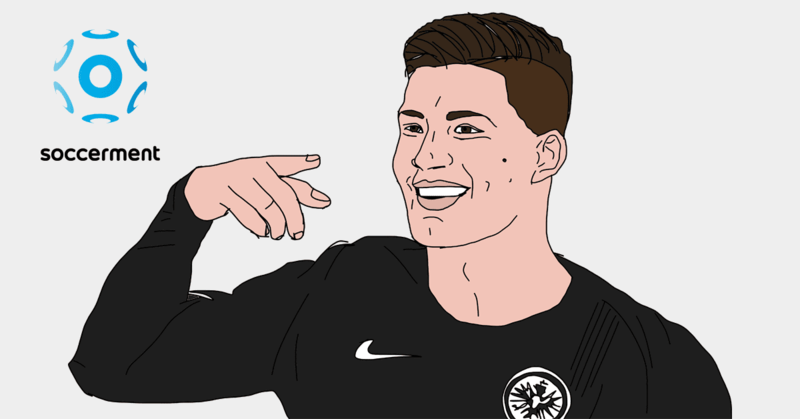 While his defensive contribution was slightly sub-par, he leveraged on his build-up mastery to lead Croatia towards a historic World Cup final. A higher-than-average pass accuracy of 89% (excluding extra-times), a higher involvement in the game (65 passes P90 vs 53 average) and a high xA P90 (Expected Assists per 90 minutes) translate into a SPR of 67. Barcelona’s Ivan Rakitic was clearly a key player for Croatia at ‘Russia 2018’, creating with Modric and Brozovic an impressive trio of central midfielders (Brozovic playing behind Rakitic and Modric in the 4-1-4-1 formation of Zlatko Dalić). Rakitic played slightly less than Modric (638 minutes), but covered more distance (72.5 km). 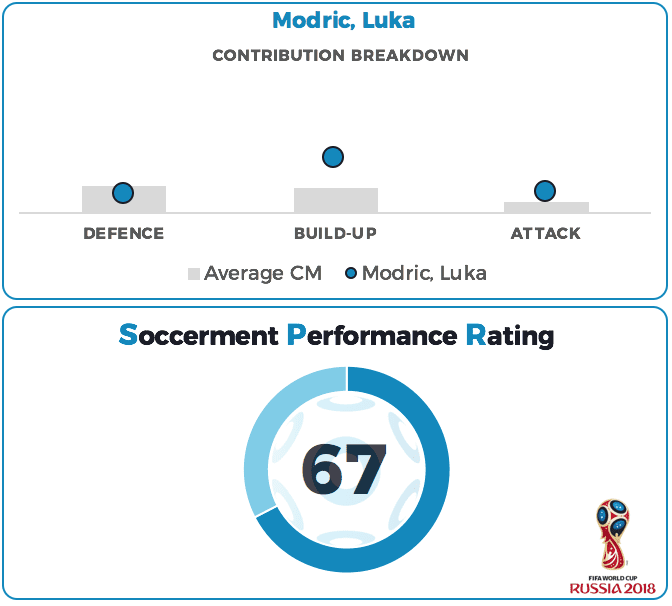 He displayed a lower pass accuracy than Modric (84% vs 89%), but that is mainly a function of his higher propensity for long balls (16% of total passes vs 12% Modric). 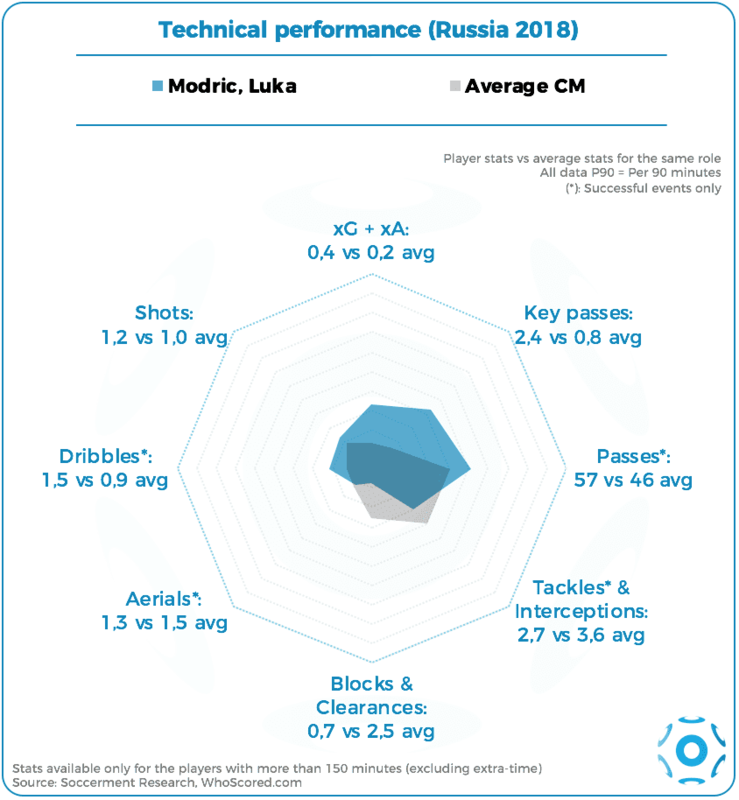 In the spider chart below, what is notable is the higher number of shots per 90 minutes (2.5 vs 1.0) compared to the average central midfielders in the World Cup. Rakitic receives a SPR of 63. 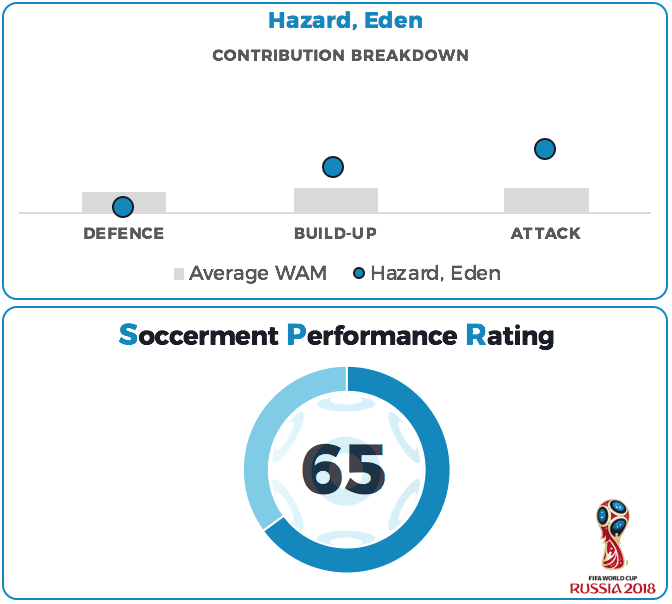 Chelsea’s Eden Hazard played quite an outstanding World Cup. Six matches, 518 minutes in total, scoring 3 goals and providing 2 assists. 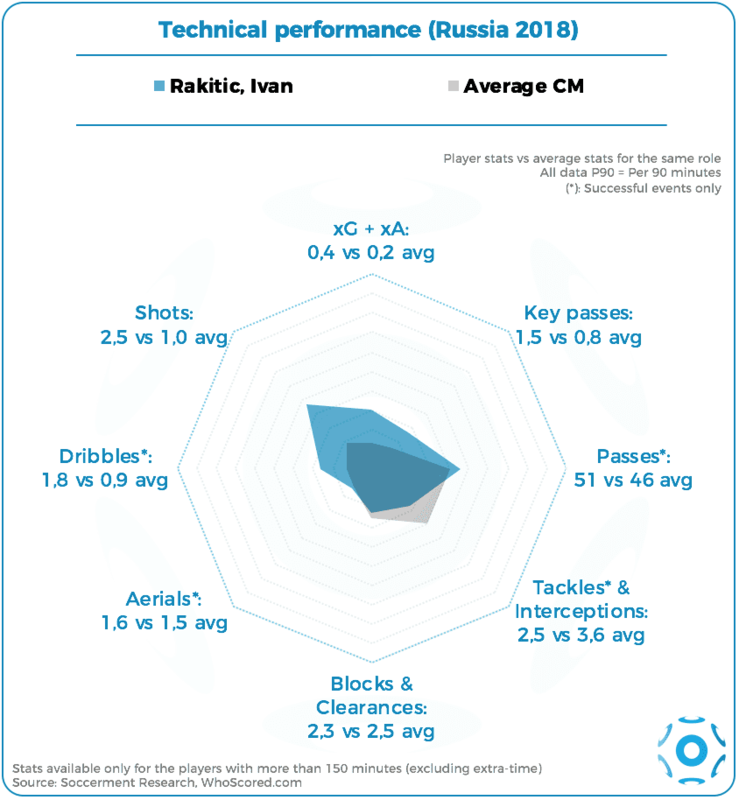 He was the player completing the most dribbles (40) and, from the spider chart below, what emerges is a higher number of shots per game (compared to the average wide attacking midfielder – WAM), also with a higher xG per shot. This indicates that Hazard took shots when the chance of scoring was higher, as compared to his peers. For his performances, Hazard receives a SPR of 65. Manchester City’s Kevin De Bruyne wins the race to enter our Top-11 list, as central attacking midfielder (‘CAM’), over Coutinho (Brazil) and Isco (Spain). 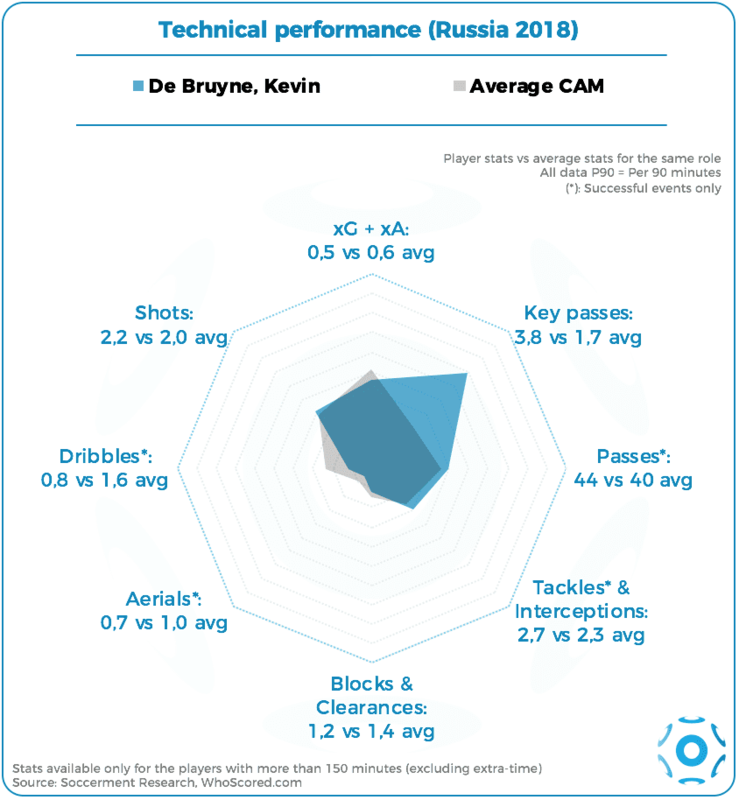 De Bruyne played 540 minutes at ‘Russia 2018’, in which he was able to score once and provide 2 assists (his specialty). What is most notable of his spider chart below is, in fact, the number of expected assists per 90 minutes, of 0.4 (vs 0.2 average for CAMs). That would equal to 2.4 assists in total, 0.4 more than he actually did. Our system sees for De Bruyne a SPR of 60. 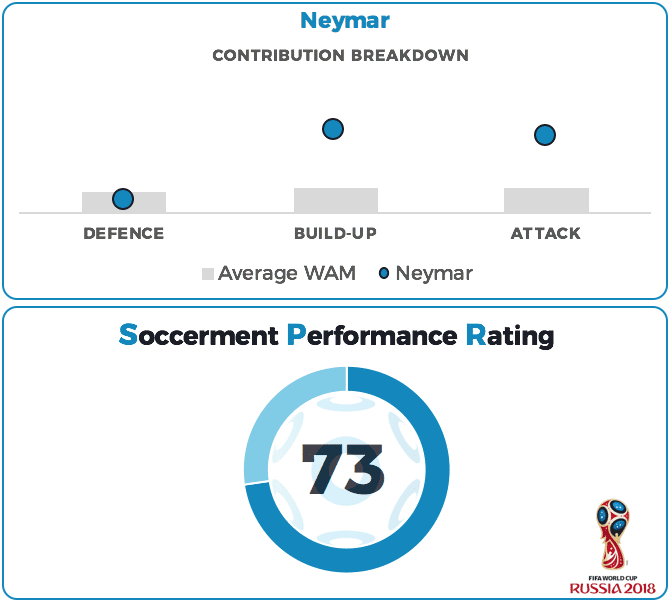 The World Cup performance of PSG’s Neymar is quite divisive. Analysts, like ourselves, rate it highly, while the comments from the pundits, the media and the public are all quite negative. In our view, this is likely due to what goes beyond pure football events. In this specific case, how Neymar behaved when tackled by the opponents. It also has to do with the high expectations accompanying Neymar into the competition. As always in life, happiness equals reality minus expectations. 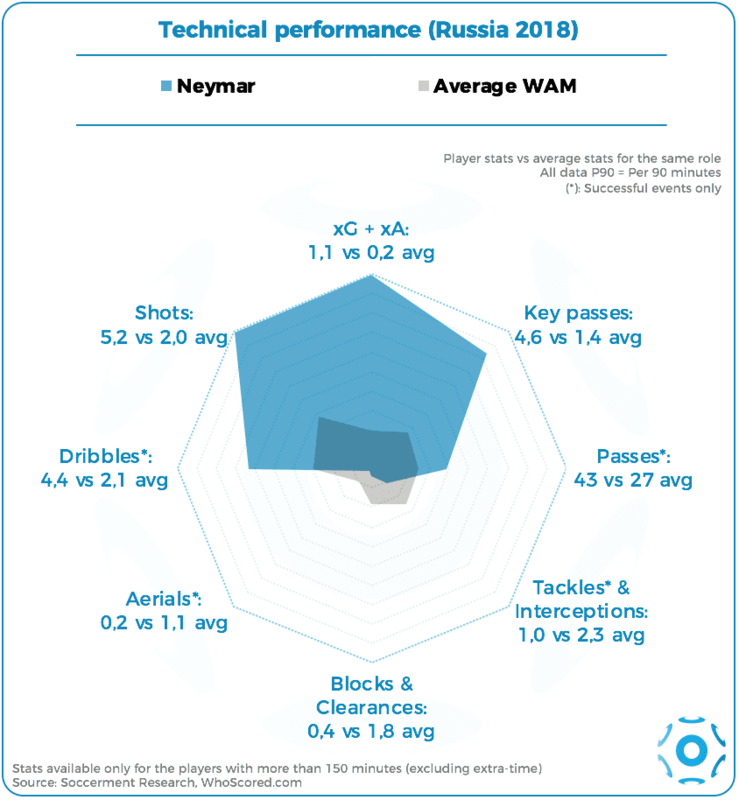 Leaving the rolling part of the story aside, the spider chart below clearly shows that Neymar was one of the best players of the competition. Many accurate dribbles and many shots per game, with a very high accuracy. Our model estimates xG of 2.6 vs the two goals he actually scored. Further, he recorded 0.6 Expected Assists per 90 minutes, the highest of the competition. The SPR sees Neymar at 73 (second-best SPR after Trippier). Atletico Madrid’s Antoine Griezmann won the World Cup with France, scoring 4 goals and providing 2 assists. Not a bad campaign, from the finalisation point of view, right? 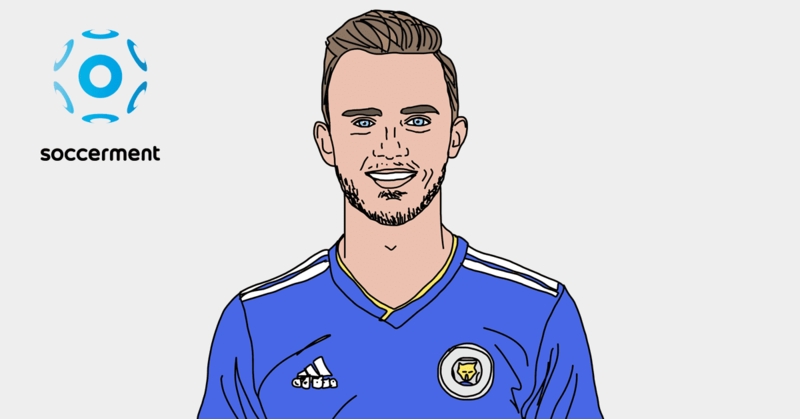 The Frenchman however makes the cut into our Top-11 selection mainly because of his outstanding contribution to the team’s buildup-up process. He was often involved with France’s attacking transitions and, in fact, his number of passes per 90 minutes was >50% higher than the average forward. He often took shots from distance (xG per shot of 0.08), but this didn’t affect his shot accuracy, of 50% (although this includes the 3 penalties he scored). The goal against Uruguay was definitely lucky. But without some luck, it is difficult to win the World Cup. Griezmann receives a SPR of 69. 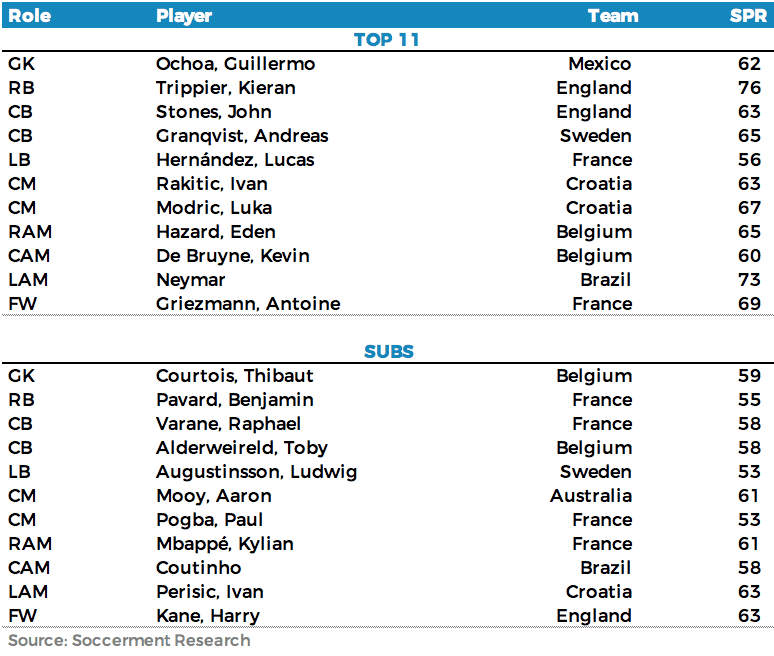 In the table below, the full selection of 22 players: our Top-11, as well as their substitutes. Some of the subs were just “unlucky” to play in the same position of an outstanding performer. For example we could not field in our Top-11, the player who probably impressed the public the most: Kylian Mbappé. 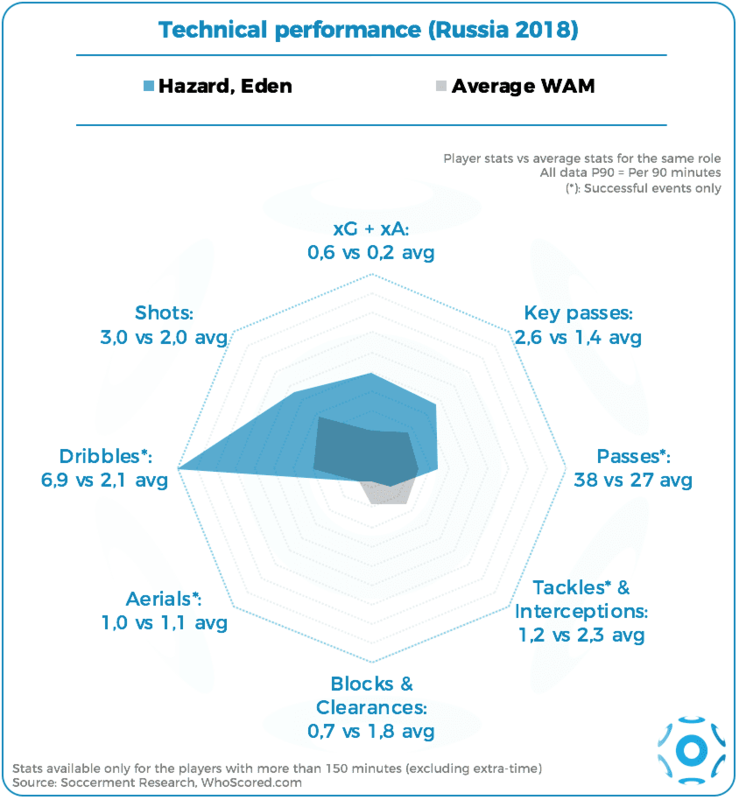 Our algorithms prefer the performance of Eden Hazard, despite we have always liked Mbappé a lot. Our system allows us to notice players which would we would have otherwise missed, mainly because they do not appear much in the media or do not play in big clubs. The objective of our system is exactly to unearth the underrated players, helping at discovering talents. In this final section (sorry for the long article!) we focus on two players whose stats really caught our eyes. 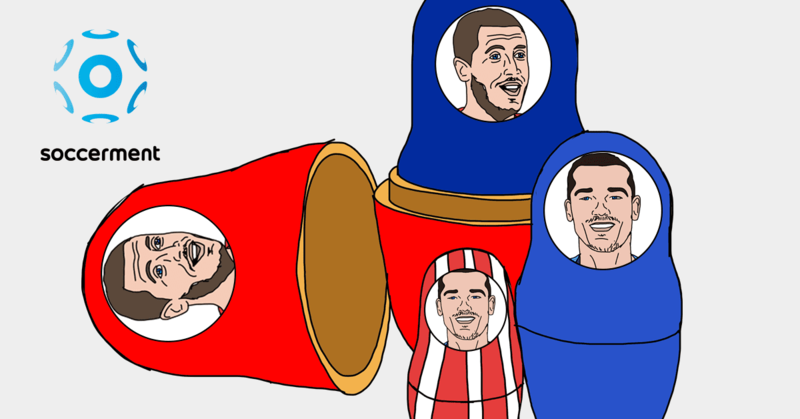 So much that we decided to review all of their World Cup matches. They did not enter our Top-22 list only because of the limited amount of playing time. Let’s start from the Tunisian number 10, Wahbi Khazri. Khazri (27) was just signed by Saint-Etienne after an underwhelming spell at Sunderland. Last year he played with Rennes, on loan from the English team, where he scored 9 goals an provided 2 assists. At the World Cup, he collected 2 goals and 2 assists, a huge achievement for any player who does not pass the group stage. It is even more remarkable considering that Tunisia only won against Panama and were defeated by both Belgium and England. 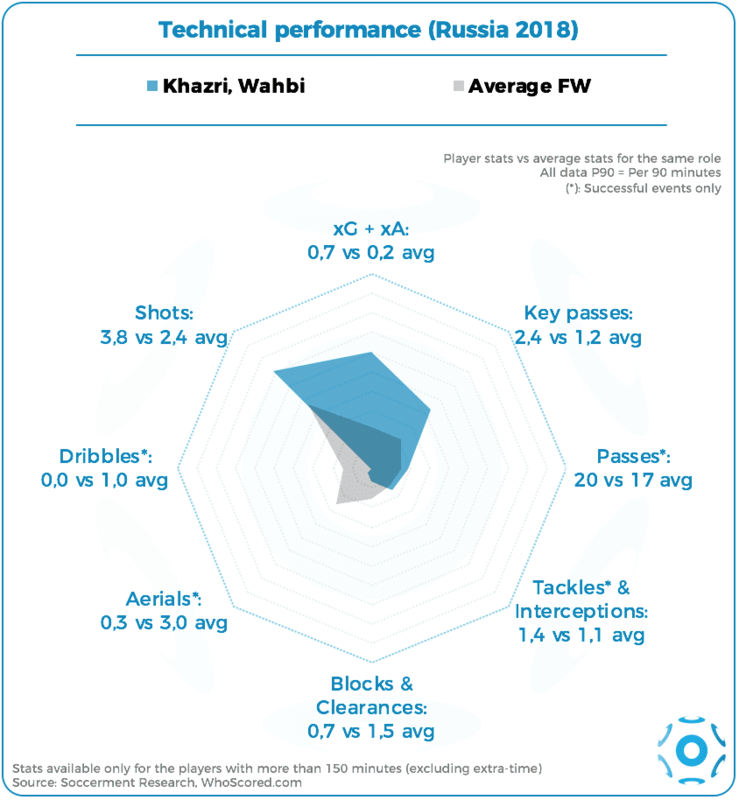 Khazri impressed our algos for the ability of creating chances for his teammates (xA P90 of 0.3, tripling the role average) and for being able to shoot almost 4 times per 90 minutes (and with a solid xG per shot). Our SPR for Khazri points to 60, but bear in mind that the unadjusted SPR would be 76. This final paragraph focuses on a 28 years old Saudi Arabian midfielder named Salman Al-Faraj. Last year he played for Al-Hilal, the most successful Saudi Arabian club, based in Riyadh. Al-Faraj played 270 minutes at ‘Russia 2018’, scoring one penalty against Egypt. He did not actually provide any assists, but our model sums a total of 0.9 Expect Assists for him, out of the 11 key passes he made during the competition (0.08 xA per key pass). Al-Faraj receives a SPR of 50 in the FWC-adjusted version, which however is 62 in the unadjusted format. We would encourage the reader to re-watch Saudi Arabia – Egypt (2-1) and see how many accurate long balls, as well as intelligent through-balls Al-Faraj played during that match.